Time is our most precious resource, an arbitrary commodity that always leaves us wanting more. Fortunately, every four years, we are given a gift: an extra date added to our calendars, another night full of infinite possibilities just waiting to be discovered. Brockmans Gin’s newest cocktail, the Spirited Leap, is all that is needed to stop the clock and own the night, after all, time is willing to wait for those who are willing to use it. The intriguing, elegant and smooth blend of botanicals and notes of blueberry and blackberry in Brockmans Gin stop time when mixed with fresh lemon juice, simple syrup, raspberries and blackberries, making it the perfect cocktail to indulge in an extra night like no other. Add the raspberries, blackberries and the simple syrup to the shaker and then muddle the ingredients together. Add the Brockmans Gin and fill up the glass with ice and shake. To serve, fill a tumbler with crushed ice and single strain the mixture into the tumbler. 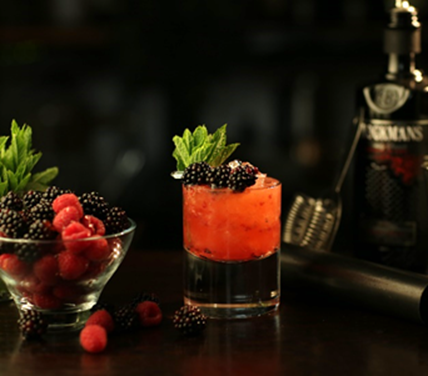 Top the rest of the glass with more crushed ice and add blackberry, raspberry and a sprig of mint for garnish.